If/when we have any results from our evidence review team on this investigation, it will be posted here. Check back often for updates. Amanda Gendron, you will be joining our team on Halloween night! Congratulations! Check out the video her and her talented kids submitted below! 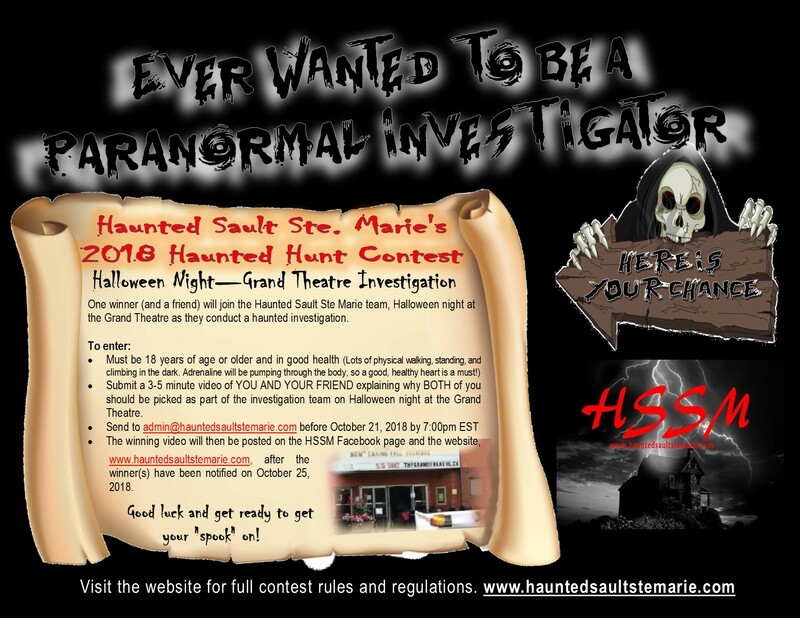 The 2018 Haunted Hunt at The Grand Theatre contest is sponsored by Haunted Sault Ste Marie. The contest starts on September 21, 2018 at 8:00am and closes on October 21, 2018 at 7:00pm. The contest is open to residents of Canada who have reached the age of 18 years. Employees, representatives, and agents of the contest sponsors, and members of the immediate family (parents, children, siblings and spouse, regardless of where they live) and household of such employees are not eligible. 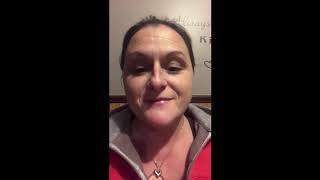 Send a 3-5-minute video with you AND your friend (the ‘DUO’ who will be attending the investigation if winners), explaining why the two of you should be chosen to join the Haunted Sault Ste Marie team on Halloween night, October 31, 2018 at the Grand Theatre. LIMIT OF ONE (1) ENTRY VIDEO PER ‘DUO’. There is only one prize per video (‘Duo’) chosen as the winner. Prize will be to attend The Grand Theatre at 641 Queen St. East, Sault Ste. Marie, Ontario, Canada on October 31, 2018 to join the Haunted Sault Ste Marie team in a paranormal investigation. After the closing of the contest on October 25, 2018 at 7:00pm, the Haunted Sault Ste Marie team will vote on the video entries. Once a winner is selected, an announcement with be made via Haunted Sault Ste Marie’s Facebook page as well as the website. In order to be declared a winner and be able to claim the prize, both person in the video will need to be reached by telephone or e-mail within 48 hours of announcement. In the event contact is not made within the 48-hour period, the selected participant’s entry will be void and a new selection will be made following the official contest rules until a new winner is selected. All information provided by participant must be complete and accurate. Sponsors will not be held responsible for any and all telephone problems, unclear voice mail messages, a late/incomplete/erroneously sent prize claim. WARNING: ANY ATTEMPT BY AN ENTRANCE OR ANY OTHER PERSON TO DELIBERATELY DAMAGE ANY WEBSITE OR UNDERMINE THE LEGITIMATE OPERATION OF THE CONTEST IS A VIOLATION OF CRIMINAL AND CIVIL LAWS AND SHOULD SUCH AN ATTEMPT BE MADE, SPONSOR RESERVES THE RIGHT TO SEEK DAMAGES FROM ANY SUCH PERSON TO THE FULLEST EXTEND PERMITTED BY LAW. Prize must be accepted as awarded. No substitution of prizes is permitted except by sponsor in its sole discretion. Sponsor reserves the right to substitute any prize with another prize of equal or greater value, if a prize cannot be awarded as described for any reason, prizes are non-transferable and are not redeemable for cash or credit, in whole or in part. Entrants agree to abide by the terms of these Office Rules and by all the decisions of the sponsor, which are final in all matters pertaining to the contest. Contest is subject to all applicable laws. By entering, participants release and hold harmless sponsors, its affiliated and related companies and advertising, promotion agencies and all of their respective directors, officers, shareholders, employees, agents, successors, and assigns from any and all liability for any injuries, loss or damage of any kind arising from or in connection with the contest or any prize won. Winners will be required to sign and return, within the time period indicted on the documents, a Decoration of Compliance with Contest Rules and a full Liability and Publicity Release and/or any other document. By entering, you consent to Sponsor’s use, should you become a winner, of your name, place of residence and photograph or other likeness, and your testimony without further compensation or notice, for publicity, advertising or informational purposes in any media or format (including the Internet) in connection with the products, the contest, or future similar contests. By entering, you declare that you have complied with the Contest rules. Without limiting the release, and for greater certainty, the Contest Entities will not be liable for: a) any incorrect or inaccurate information, whether caused by Contest Website users or by any equipment or programming associated with or utilized in the Contest or by any technical or human error which may occur in the processing of entries in the Contest; b) any error, omission, interruption, deletion, defect or delay in operation of the contest website or any transmission in connection with the Contest; c) any communications line failure, theft, destruction or unauthorized access to, or alteration of, entries; d) any problems with, or technical malfunction of, any telephone network or lines, computer on-line systems, servers or providers, computer equipment, software, or failure of e-mail which may occur for any reason whatsoever, including technical problems or traffic congestion on the Internet or at any website or combination thereof; or e) any injury or damage to participants’ or to any other person’s computer related to or resulting from participating or downloading materials in this Contest. If the Contest is not capable of running as planned for any reason, including infection by computer virus, bugs, tampering, unauthorized intervention, fraud, technical failures, or any other causes beyond the reasonable control of the Contest Entities which corrupt or affect the administration, security or proper conduct of this Contest, Sponsor reserves the right at its sole discretion to, without advance notice, terminate or suspend the Contest, in whole or in part, or modify it in any way. By participating or attempting to participate in the present contest, all individuals release the contest organizers, their advertising and promotional agencies, their employees, agents and representatives from any damage that could be incurred due to their participation or attempted participation in the contest.